Good news — we had Christopher Hollingsworth, MD, from NYC Surgical Associates explain what can happen if you see the scale dip too low, too quickly. 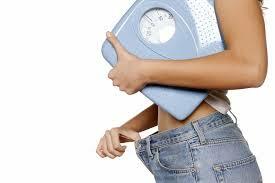 He also provided us with a few tips for losing weight the right way — as well as keeping it off. What's A Good Amount To Lose? Instead of thinking about weight loss in pounds, Dr. Hollingsworth recommends looking at the percent of bodyweight lost. A safe metric to aim for is a loss of five to 10 percent of your bodyweight over a three-month period. Anything more than that puts you at "risk for having some problems associated with weight loss," he says. "Once you have lost more than 10 percent of your bodyweight within three months, you are most likely going to have significant issues." Dr. Hollingsworth's approach is different than the popular opinion of losing up to two pounds per week. He says it's important to keep in mind that there is no one-size-fits-all approach to determine the specific number of pounds since everyone is different. For instance, when keeping bodyweight percentage in mind, the healthy weight loss range will be larger for an overweight individual than someone who is not considered overweight. He also believes that looking at weekly weight loss isn't always the best indicator, which is why he focuses on a three-month window. "When running a caloric deficit to lose weight, your average trend over a month is important, but targeting weekly goals can be unfairly discouraging if results are not seen." According to Dr.Hollingsworth, there are many side effects that can happen when you drop too much weight in a short period of time. You might experience constipation, diarrhea, nausea, or abdominal pain. "Your intestine is used to handling different types and amounts of food, so it goes through an initial adjustment period," he says. "If there's less food to push through or fewer fats and oils to lubricate the passageway, you decrease the amount of salivation that would aid in stimulating the gut for a smooth digestion"
What's more, you might also experience headaches and mood swings. "Headaches come from running a prolonged caloric deficit, as your body switches to a different form of metabolism while you are fasting or crash-dieting," says Hollingsworth. "Your body starts oxidizing fats, and even breaking down muscle to convert these energy sources into a usable energy form called ketone bodies. During the period where your body is switching from using glucose to ketone bodies, it transiently uses another form of stored energy called glycogen that is good for meeting short-term energy requirements," he says. If those mood swings aren't bad enough during the daytime — they might be even worse due to a lack of sleep that can happen when you're losing too much weight on a restrictive diet and fitness plan. "Sleep is disturbed because of fluctuating stress hormones, including cortisol, insulin and adrenaline. Your body is using these hormones to fine tune your metabolism to compensate for fasting, but these hormones can mess with your sleep-wake cycle, as well as make you feel bad in general," Hollingsworth explains. In more extreme cases, malnutrition can result and lead to a host of symptoms like dizziness, decreased energy, and swelling of the body. This will also put you at risk for developing secondary conditions like anemia, muscle wasting, and brittle hair. To avoid these pitfalls, it's important to do your research and talk to a doctor before making any major diet changes. During your diet, keep track of how your body feels. If you constantly feel sluggish or unwell, add in additional complex carbs to see if that makes a difference. This is even more important if you're also working out — you want adequate fuel to accomplish and recover from workouts. Lastly, remember that weight can shift based on what you eat, how much you sleep, how stressed you are, and other factors, he says. So, don't get too caught up in it and let it derail your progress. "Your body weight is good to assess in regards to the general trend, but it is not something to target from day to day, because it is susceptible to fluctuation based on temperature, fluid intake, and exercise," he says.